“Designed to be FAST, Designed to be TOUGH.” Does that sound familiar to you? Well, that is ARRMA RC’s very own tagline. If you have been into remote control cars for a while, then ARRMA RC is probably not new to you. But if you are a beginner and has never heard of this brand before, then count yourself lucky. This article is all about ARRMA RC. To this day, there are already countless brands of RC vehicles. Each of them claiming to be the best, the fastest, and the toughest. How do we know that they live up to their claims? As a beginner, how can you be so sure to trust one brand? We wrote this guide hoping to help you get to know ARRMA RC better. We heard good things about this RC manufacturer and we would love to share them with you. Read on to learn about the brand, its products, and what RC enthusiasts and ARRMA RC users say about them. Before buying any remote control car either for your kids or for yourself, you first need to check the brand of the remote control car. The name of the company can already tell you much about the quality and performance the RC car can do. For those people looking to get into the world of RC, this brand has quickly become a go-to manufacturer. ARRMA RC (pronounced the same as ‘armour’) prides itself on designing fast and tough cars. In their website, ARRMA RC said that they are a brand that defines high-speed and super tough RC action. ARRMA RC has a wide range of exciting vehicles. Their line provides the perfect opportunity for beginners and veterans alike to enjoy dirt-blasting RC driving. The vehicles they designed provide an opportunity for you to learn new skills. You can even inspire other people and share the passion that you have for RC racing with ARRMA RC.. It is the mission of ARRMA RC to design inspirational radio controlled cars that will bring new people to RC. So, whether or not you are new to the hobby of Radio Control, or a seasoned RC fan, ARRMA RC has something for you. ARRMA RC can offer you exactly what you need to take on new challenges. The ARRMA RC vehicles were designed from the ground-up by experts who fully understand the great importance of strength, speed, and incredible value. ARRMA RC proudly calls their vehicles, ‘Designed to be Fast, Designed to be Tough’. So, if you are searching for the ultimate RC experience that can change the way you choose to have fun, then ARRMA RC the brand for you. This brand has a spanning range of high-quality and stylish trucks and buggies. ARRMA RC has powerful all-terrain vehicles and Ready-to-Run packages that allow you to hit the dirt with no delays. What ARRMA RC does is put you straight into action. Continue reading to know the coolest ARRMA RC vehicles you can choose from. These are your remote control monster trucks. Remote control monster trucks must have four huge, deep tread tires which are usually in 4WD configuration. You already know that remote control monster trucks are pretty amazing off-road but can be very slow on the road. Remote control trucks may flip a lot when you try to make high speed turns. However, ARRMA RC designed their trucks to be fast. Therefore, they excel among other brands in this category. ARRMA RC monster trucks can make themselves known on any terrain. Remote control trucks are can climb, pull, and crush. If you want to drive in the woods, rocky grounds or on the grass the most, ARRMA RC monster trucks are your best option. Check out the ARRMA RC truck below. You’ll definitely love it. This is a multi-award winning 2WD Monster Truck. 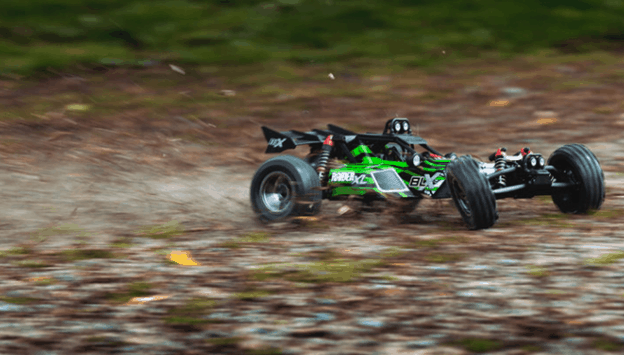 The GRANITE BLX will blast you straight into the action for a high-speed RC excitement. This ARRMA RC truck is equipped with BLX85 brushless power and super durable composite, steel and aluminum parts throughout. It has the attitude and strength to allow you to challenge the most extreme conditions. This monster truck was built for an exciting BLX Brushless speed of 60mph. GRANITE BLX has the power to smash any terrain you come upon to. It can command any environment with its waterproof electronics and super-tough components. 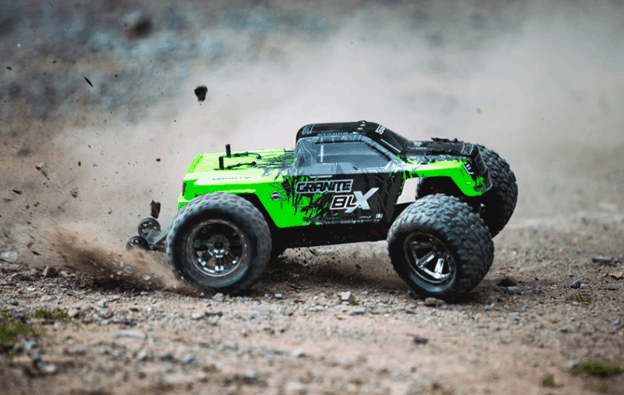 The GRANITE BLX monster truck comes with an eye-catching Monster Truck Body Shell that is made of very strong Polycarbonate. ARRMA RC designed this truck to have a large-scale, multi-surface dBoots tires. And they provide an insane amount of traction on any surface so you can always stay in control. You can master advanced driving techniques so quickly and easily. This ARRMA RC truck is based around a very tough composite chassis. It is with oil-filled shocks and awesome suspension arms which provide consistent performance. Did we mention that this waterproof BLX85 ESC allows for a fast and exciting transfer of power when the conditions are wet and wild? You will just need to add your choice of a battery pack, suitable charger, and four AA Batteries for your 2.4Ghz radio transmitter. Then you are ready to go. 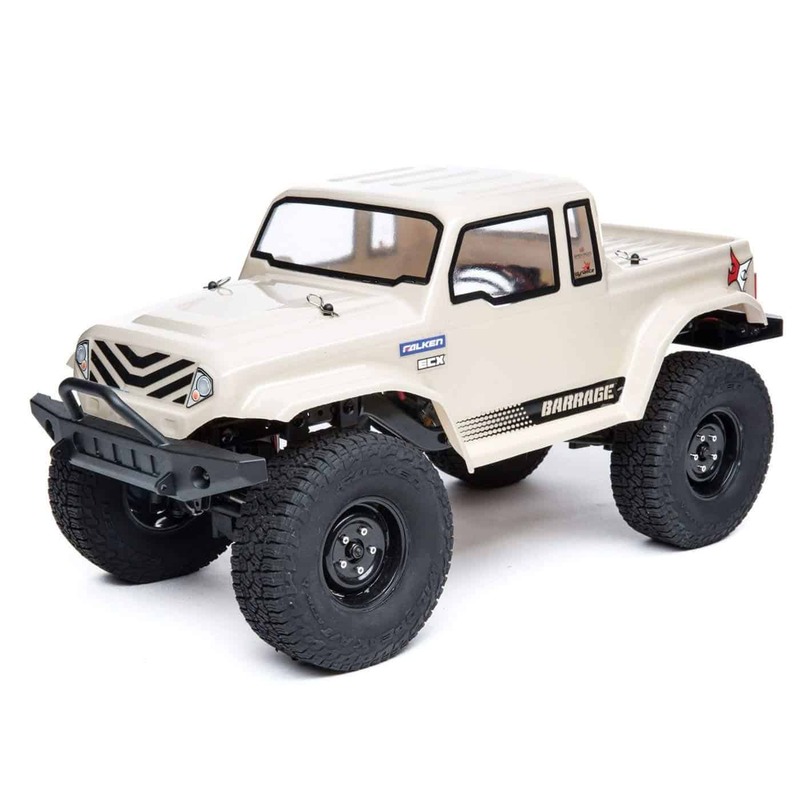 By the way, this RC truck will accept 2S or 3S LiPo batteries or 6 or 7 cell NiMH stick packs. The maximum dimensions of the battery pack are 6.18 x 1.89 x 1.06″ (157 x 48 x 27mm). You won’t need to worry about dust and water. Because the ARRMA radio box is fully waterproof and dustproof. This is designed to keep your 2.4Ghz receiver safe, regardless of how much dirt and water you blast through to. Next, their TTX300 radio system offers fast and consistent control for your truck. By using 2.4Ghz technology, your ARRMA RC vehicle can be maneuvered by a wheel and trigger style radio transmitter. 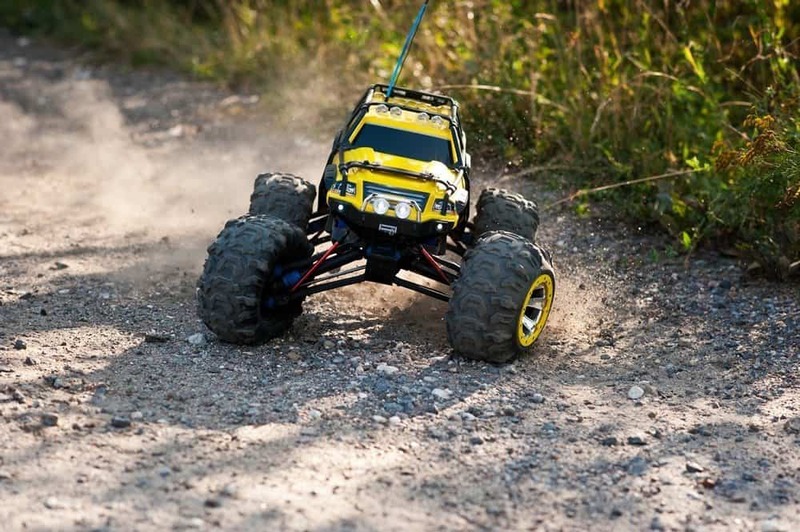 The ARRMA RC GRANITE BLX monster truck is ideal for new users and experienced ones alike. They have an adjustable steering and throttle trim that will allow you to tune your control experience easily and to suit your personal needs. RC Short Course racing is based on the championship off-road racing tour trucks. 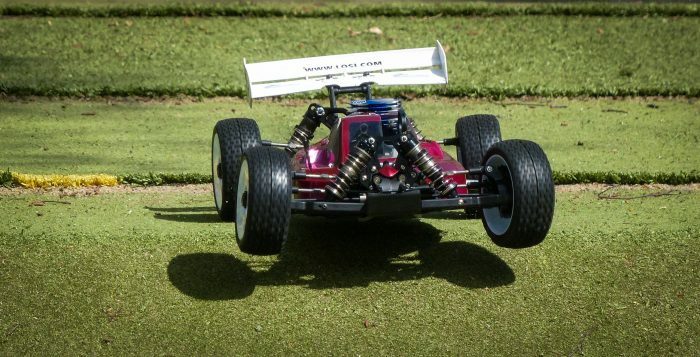 It is exhilarating and continues to be the fastest growing segment in RC world. Short course racing has been drawing huge numbers of manufacturers making short course trucks. These trucks are built to tough and able to withstand large jumps and truck to truck battling. The excitement of short course racing is contributed to its quick rise in popularity. Short course trucks, unlike many other forms of radio control off-road racing, look just like full-size racing vehicles. Short course trucks are fun to bash and to race. These RC trucks can get physical out on the field without each bump causing a breakdown. That’s if they have full fenders and complete with bumper protection. This is ARRMA’s all-new 10th scale SENTON 4×4 Short Course Truck. The SENTON 4×4 MEGA will provide unrivaled traction on any surface. 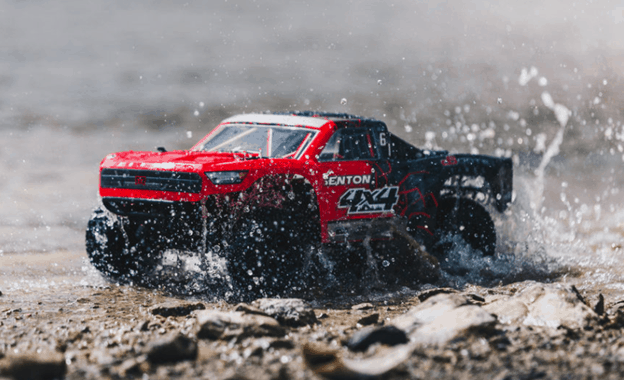 The SENTON 4×4 MEGA has a full-scale Short Course Truck looks. And it will launch you straight into the mud-blasting, dirt-roosting fun. The SENTON MEGA is built to soak up the most intense all-weather thrills and spills. This short course truck is pumped with full of high-quality ARRMA design features. This can only mean that with this vehicle, you can conquer anything in your path. This ARRMA RC short course truck has quality dBoots FORTRESS MT tires. The multi-spoke wheels offer superb grip on a variety of surfaces. 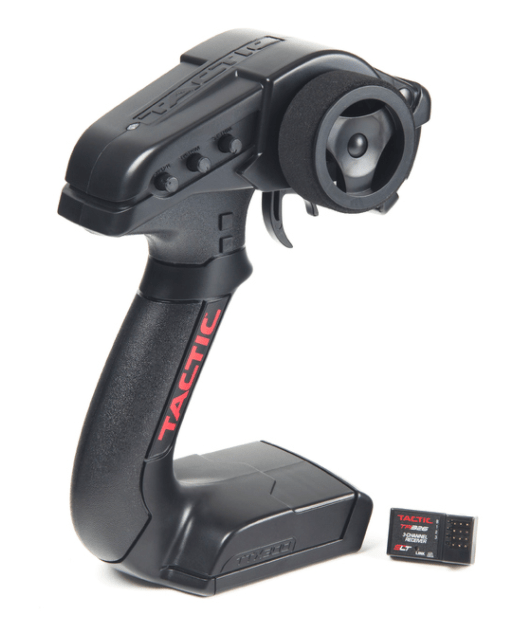 This vehicle comes with a TTX300 radio system which offers fast and consistent control for the ARRMA vehicle. The ARRMA RC short course is controlled by a wheel and trigger style radio transmitter with a 2.4Ghz technology. This ARRMA RC is great for both newbies or experienced bashing fans. Its adjustable steering and throttle trim will allow its users to tune their control experience to fit their needs. Remote control buggies are a crossover between the street RCs and off-road RCs. This type of RC vehicle works very well on flat surfaces. Buggies have the right height to handle off-roading too. A remote control buggy is the second fastest on the road. However, they are the slowest off-road due to their low wheelbase. But this is not the case for the buggies that ARRMA RC designed. They’re fast! If you were someone who could not decide yet what type of car they want, on-road or off-road. Then a buggy is right for you. This is because buggies can be used for both. What’s cool about this type of RC car is that buggies are of open-wheel design with lots of ground clearance. They have a full-travel suspension and knobby tires for lots of grips. Buggies can travel almost anywhere and on any terrain. The rougher the terrain, the better ride it is. Let’s see if you’d like this ARRMA RC buggy. Check it out below. We bet you will like this buggy. The RAIDER XL BLX is a 1/8 scale 2WD Desert Buggy. This ARRMA RC buggy is ready for any surface, even the roughest terrains and the most extreme conditions. You won’t have to worry about getting it soaked. It has waterproof electronics and it is big, stable, durable, and ready for extreme RC adventure. This ARRMA RC buggy is also equipped with the great performance of the ARRMA BLX 3800kv brushless motor and the BLX85 waterproof ESC. Because of the independent oil-filled shocks, this buggy can run fast while handling the roughest surfaces. User can just adjust the ride height of the RAIDER XL BLX. and access advanced tuning options with its super high quality units. This buggy is supplied with a tough polycarbonate body shell. They are also pre-decaled with cool ARRMA livery. There is a strong black nylon wing that completes its amazing Desert Buggy looks providing more stability at high speed. Another amazing feature of this buggy is its multi-surface dBoots tires with multi-spoke wheels. The side bump bars will protect this ARRMA RC buggy during an extreme action. You may choose to add your favorite battery pack, charger and four pieces of AA Batteries for your 2.4Ghz radio transmitter. The ARRMA RC RAIDER XL BLX will accept 2S LiPo batteries, 3S LiPo batteries, 6 or 7 cell NiMh stick packs. The maximum dimensions of its battery pack are 7.87 x 1.89 x 1.06 inches (200 x 48 x 27mm). This ARRMA RC RAIDER XL BLX features an all-new radio box design. The ESC and servo wires now pass through a foam seal. This then slides into the side of the radio box so the wires can stay in place when the lid is removed. Its radio box has increased internal volume. Plus, a continuous rubber seal between the radio box base and the lid can be seen. This will protect the receiver from any element that can destroy it. The TTX300 radio system of the ARRMA RC buggy offers fast and unfailing control so you can have a blast with your cool buggy. If you just got into the hobby of RC or not very in touch with new tech, you may probably not know the difference between brushed and brushless motor systems. But do not worry. We will break it to you as simple and brief as possible. If you are new to the world of radio control or are just out of touch with the new technology, you may not know the differences between conventional brushed and brushless motor systems. Brushed and brushless motors are the two main types of motors for electric RC cars. First of all, brushed motors have brushes inside them. Typically, these brushes are made of silver, copper, or graphite. These used to convert electricity into motion. When they make contact with a mechanical rotary switch called a commutator, the brushes deliver an electrical current. As soon as the current is passed through the windings, there is a magnetic field created, repelled and attracted. This consequently causes the armature or the rotor to rotate. In the case of brushed motors, the windings are located on the rotor and the magnets are on the stator. On the other hand, brushless motors are constructed differently. For brushless motors, the windings are located on the stator instead of the rotor. Meanwhile, the magnets are placed on the rotor. Through this unique design, the need for brushes is being eliminated altogether. Other than the external rotor, a brushless motor makes use of three phases of driving coil. It also uses an extra sensor device to sense the position of the rotor and the drive electronics. In addition, it also makes use of an amplifier that is triggered by an electronic device. An example of this is an optical encoder which creates a magnetic field inside the motor. If you did not get that, maybe this video can help. If you need parts for your ARRMA RC vehicle, you do not need to look far. The brand has all of these for you. ARRMA RC has kits, bearings, bodies, fittings, individual spares, spares sets, tires, and wheel tire inserts. Now that you have an idea what products ARRMA RC have, it’s time you hear a few reviews about the ARRMA RC vehicles. According to customers who left reviews on Amazon, the Granite BLX is a good basic truck to mess with. Others loved it for the price. There’s also one who said that his kid loved this monster truck. Users find the ARRMA RC Senton Mega an amazing and RC truck. It jumps and handles so well right out of the box. The Arrma Senton 4×4 is a true beast, it can conquer just about anything. It’s fast and tough. People love this ARRMA RC Raider-XL because it is fast and fun. Customers also appreciate this buggy because it is pretty big too. Kids also loved this buggy. We hope you learned something from this article and may this help you find the best ARRMA RC product for you. Because whether you are new to the world of RC or a fan, ARRMA RC can offer you exactly what you need to take on new challenges. We are hopeful that this guide can light a spark in you that can make you start your RC journey with ARRMA RC.